This work is the first comprehensive description of Makalero, a language spoken by approximately 6,500 speakers in the Iliomar subdistrict, in the south-east of the Republic of East Timor. While previous sources considered it to be a dialect of the larger language Makasae, the present study, which is based on primary data gathered by the author during fieldwork in East Timor, notes sufficient grammatical differences from the latter to warrant the treatment of Makalero as a separate language. Together with four other languages of Timor, Makalero has been classified as belonging to the Trans-New Guinea family, making it one of the westernmost Papuan languages. While it retains scattered derivational and inflectional processes, it is largely isolating in structure. Underlying the organisation of discourse at a very basic level is the rigid structure of the Makalero clause, which allows for the expression of two verbal arguments at most. A characteristic feature of this clause structure is the presence of two distinct, mutually exclusive argument positions within the verb phrase, the first of which is reserved for undergoers, while the second may express either undergoers, or location and manner information. The description brought forward in this dissertation is not couched in a particular theoretical framework, although insights from several linguistic theories are adduced to support the analysis; it is thus accessible to scholars from differing backgrounds. With its coverage of Makalero structure from the phonology through word classes and morphology to basic syntax and some issues on the discourse level, this book is of particular interest to scholars of both Papuan and Austronesian languages as well as linguistic typology. 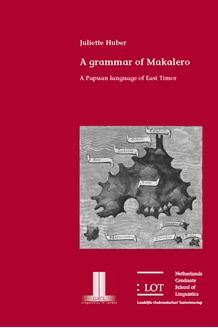 The appendices provide transcripts of several Makalero texts as well as a Makalero-English and an English-Makalero word list.